Supermarket specials that aren’t. Deliberate, or just careless? I’ve turned into one of those boring people who looks out for specials in the supermarket. 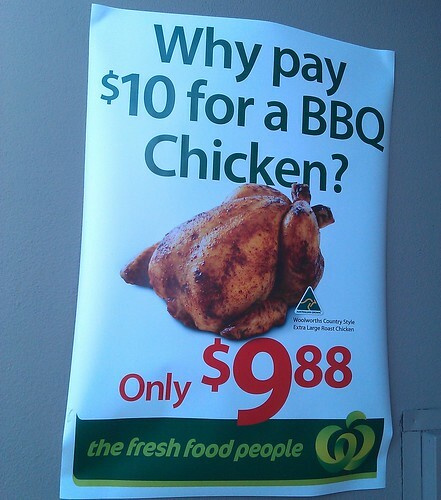 This deal is from this week’s Safeway/Woolworths catalogue. 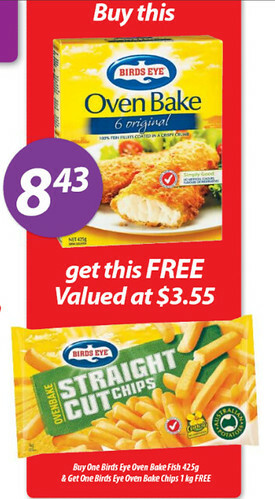 If you happen to occasionally buy frozen fish and frozen chips, it appears to be a pretty good deal, saving $3.55. At the supermarket, they’ve stacked the fish and the chips in the special together with a big sign pointing you to it. So, it’s just a matter of grabbing the fish, grabbing the chips, and heading to the checkout to enjoy your savings, right? If you try that, keep a watch at the checkout, because the items came up for me with no saving. On querying it, the lady said she wasn’t familiar with the special, but suggested it might be for specific items only. But, I protested, they’re all piled together, highlighted as one. The “special” display includes about 4-5 fish varieties, all 425 grams as specified in the special. And there are straight chips and crinkle cut, again, all in the special display. I hadn’t even seen it in the catalogue, but had found it via the display, and had grabbed the straight chips and the Deep Sea Dory original fish. With the display set up in this way, how is a punter meant to know which specific products need to be combined to get the special price? Sure, the small sign on the freezer door shows the items to be combined for the special, but it’s far from clear that it’s limited to just those two items, and the context implies it’s not. Note that both the frozen fish and the frozen chips normally live elsewhere in the frozen food aisle. 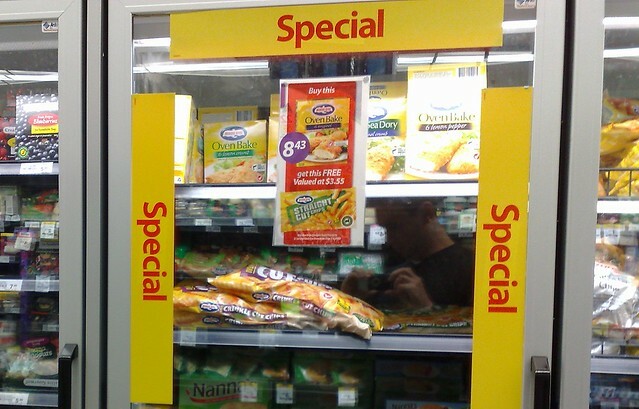 There’s no reason to be putting the items which are not part of the special into the cabinet with the big “Special” signage. In my book, the advertising, the programming of the cash registers, and the presentation of these products don’t all match up. Is it carelessness, or deliberate? And how many people just grab what they think is a special, but don’t notice at the checkout? I swapped the fish for the one covered by the special and got my $3.55 saving. How many others might notice, but not bother querying it? As always, it pays to check the small print. 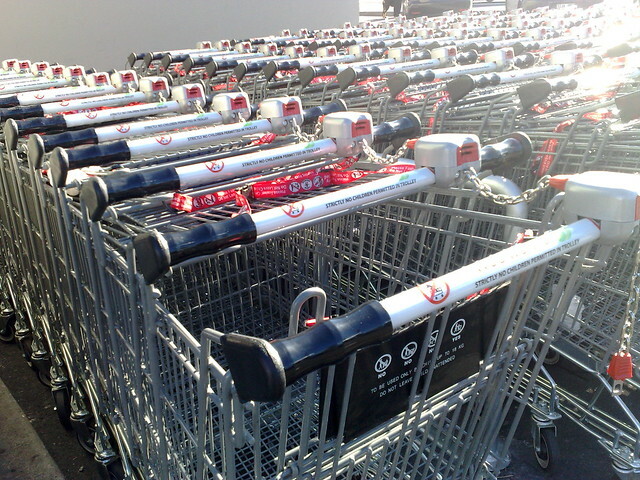 Last week Safeway Woolworths replaced all their trolleys as part of the makeover. And they all require a deposit — a $1 or $2 coin. ‘Cos while I don’t usually use a trolley, when I do, I’m sick of them having wonky wheels because people have pushed them for miles and dumped them in the street, where they get damaged. I’m sick of finding them in the park, and in my street, and even at the railway station, clogging up the entrance ramp. And I bet they’re expensive to collect and repair, contributing to higher prices. Hopefully the deposit will reduce the instances of them going missing. By the way there’s a notice at the entrance which says the supermarket will have its grand re-opening on the 29th. A bit odd if you ask me, given they’ve kept trading while the renovation’s happened. Maybe they’ll get the local member of parliament to attend. Whoever that is by then. 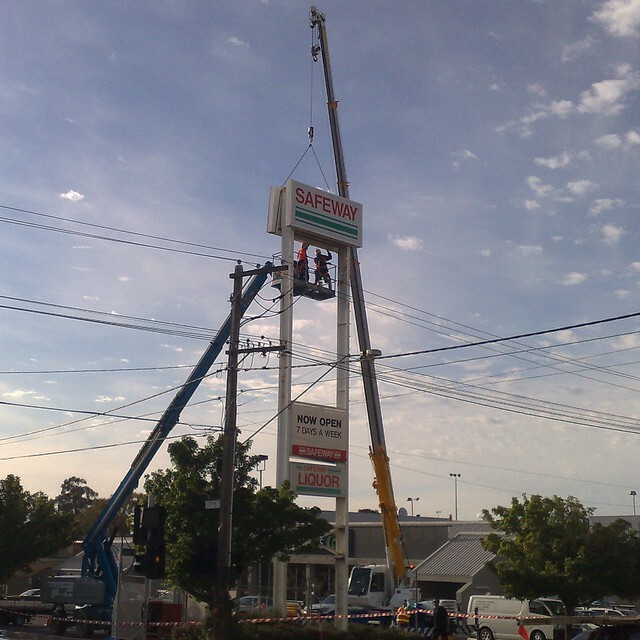 I’d been wondering how they were going to swap the very-high-up Safeway sign for a Woolworths sign. With a very big crane, that’s how. They did it yesterday. Many of the other Safeway signs have already disappeared. 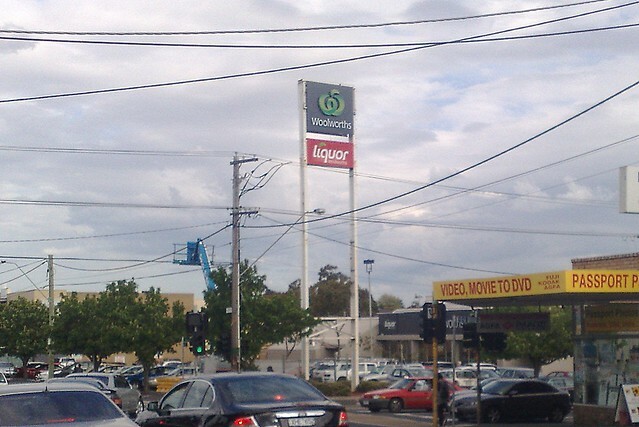 I’m not sure how long it’ll take me to get used to calling it Woolworths. At the local Safeway, the renovation (and eventual transition to “Woolworths”) is underway, and the self-service checkouts are now operating. There’s five of them, compared to three express checkouts, and eight “normal” checkouts. From memory there used to be more normal checkouts, though as at most supermarkets, I don’t ever recall all of them being in use at once. I suppose there’s something of a moral quandary about whether self-serve checkouts will cut the number of staff the supermarkets have to employ. I’m afraid my general philosophy is that if there are long queues, I’ll use whichever option is likely to get me out of there the quickest. 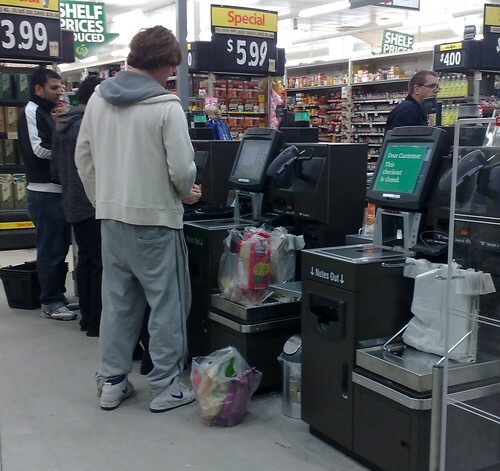 If there are no queues, the staffed checkout is likely to be quicker, as Safeway’s dedicated and tireless personnel are much more likely to know where all the barcodes are, and precisely which buttons to press to choose the butternut pumpkin (or whatever) off the fruit+veg menu. But if the queues for staff are long, and particularly if I don’t have many items to buy, I reckon the self-serve is likely to be quicker. This goes doubly at places like Big W, because I’m usually not buying lots and lots of small items, and of course there is no fruit+veg — everything’s got a barcode. So yesterday at Safeway I found myself with a basket full of about fifteen items (eg too many for the express lanes), two normal lanes open, both with 2-3 people queuing with very full trolleys. And no queue at the self-service checkouts (though one of them was out of order). 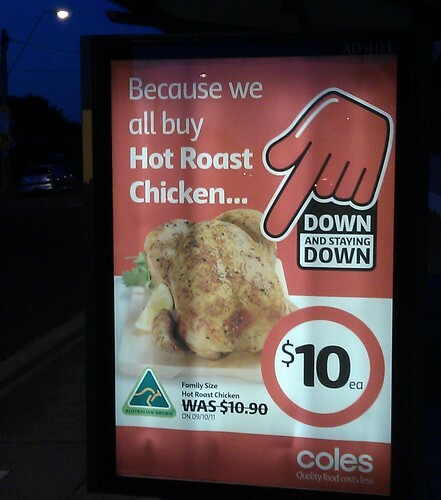 I chose the self-service, which no doubt was what Woolworths Corp had in mind all along. Any guilt about putting Rowena (family friend who I occasionally encounter on the checkouts) or her cohorts out of a job was extinguished, this time, by the sheer amount of intervention required from the staff member on duty as I scanned my items. Putting my green bag into the bagging area, and patting the bottom of it down with my hand to smooth it out set off the Incorrect Weight error, requiring assistance. Trying to fiddle around to pack items neatly into the green bag also set off the error. Accidentally double-clicking the Fruit+Veg button got the register to incorrectly charge my butternut pumpkin as mandarins, and reversing it required the staff member yet again. All in all it probably took twice as long as a transaction handled fully by a human staff member, and certainly required a lot of intervention. I’m not sure if it got me out of the store more quickly than it would have if I’d queued, but I don’t think there was a lot in it. I think in future unless (a) there’s a long queue for the human operators, (b) I’m buying only a handful of items, and (c) that includes nothing that has no barcode, I’ll avoid the self-service checkouts.